The University of Notre Dame has joined the ACC in all sports except football, where it feels like they’ve halfway joined. As an alumnus of a ACC charter member Univeristy, I am excited to welcome the storied program to our proud conference. Notre Dame will be full conference members in basketball adding them to the list of strong basketball programs that will join the ACC in coming years (Syracuse, Pittsburgh). It was beyond doubt even before this move, and adding Notre Dame only exaggerates the fact that the ACC is the premiere college basketball conference. Admittedly, it would be hypocritical for me to commend the ACC for adding more power to their already stacked basketball lineup. I’ve told countless UNC and Wake Forest fans here in Winston-Salem that the Syracuse and Pittsburgh additions were bad for the conference because they bring little to the table from a football perspective. Basketball is pennies compared to the big money of college football. The median net revenue (profit) generated by college football is nearly four times higher than college basketball ($3.15 million vs $788,000)–despite playing many fewer games. That means seven ACC schools will play in a nationally televised game on NBC at Notre Dame every three years! Additionally, it means Notre Dame will visit Death Valley (and other ACC stadiums that are less exciting) on a semi-regular basis, creating a huge matchup, a near guaranteed sell-out, great publicity, and something positive to talk about with recruits. Notre Dame football wins by joining the ACC’s non-BCS bowl lineup, giving them access to the Chick-Fil-A Bowl, Russell Athletic Bowl, Hyundai Sun Bowl, Belk Bowl, and the other incredibly prestigious bowls that are affiliated with the ACC. (Yes, I’m being facetious. Our bowl lineup is garbage after the Orange and Chick-Fil-A Bowls). My big worry was that Notre Dame would be selected over a more deserving Clemson, FSU, or VT teams for the Chick-Fil-A or Russell Athletic Bowl. Notre Dame would be a potential team to play in any of the ACC contracted bowls. Its overall record would have to be better than, equal to or within one win of ACC teams available to be selected. Notre Dame would share in the revenues if selected to any of those bowls, and get an expenses allowance. 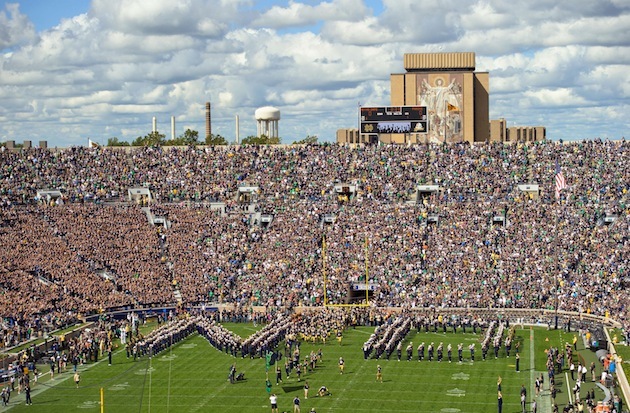 If Notre Dame is picked for a BCS game, it would keep its revenues from that appearance. This bowl partnership would begin for the 2014 season. The only problem is that if the ACC continues the new 9 game conference schedule, then in years with Notre Dame on the docket, schools with out of conference rivals will only have one flexible game on their schedule (e.g., Clemson would play Notre Dame, USC, a ninth conference game, and then one game of their choice which would likely be against an FCS school). You’d love to have more flexibility than that to set up matchups like the one Clemson enjoyed in the Georgia Dome with Auburn this season. It will be odd that Clemson has to travel all the way to Indiana for conference games in sports like baseball and volleyball, where there isn’t enough money generated to justify such a trip, but players shouldn’t mind since it is Notre Dame (and that’s still special) and frankly, those sports are largely paid for by football so they’ll have to somewhat accommodating to the needs/wants of the football program. The current football of the ACC already entails trips to Boston and Miami anyway. In this agreement, Notre Dame wins by leaving an unstable conference (the Big East) and joining the best basketball conference, and a very strong conference in baseball and the Olympic sports. Notre Dame further benefits by gaining access to the ACC’s non-BCS bowl lineup, which while not stellar is certainly better than Notre Dame’s current non-BCS bowl options. The ACC wins by bolstering their football prestige and gaining negotiating power and subsequently more money due to the many visits Notre Dame football will make to ACC schools. Further, the ACC wins by guaranteeing seven schools a nationally televised NBC game at Notre Dame every three years and the other seven schools a huge, high-demand, home game, against the most storied program in the history of college football. This agreement is a win-win for the current ACC schools and Notre Dame. As a Clemson fan, I am thrilled. Now I just want the old eight-game conference schedule back. They have Pitt and Syracuse on a lot of upcoming schedules. I wonder if they would have been willing to make this deal had we not added them to the conference. I tend to think the answer is no. Looks like this has already given us a great opportunity to get the Gator Bowl back, making our bowl lineup look a whole lot better. I also (with Syracuse as well as ND) could see us adding the Pinstripe Bowl in NYC as an additional 3rd tier bowl (it would be the 9th best if we also added the Gator Bowl) giving the ACC 10 Bowl for the 16 members who vie for ACC bowl invitations. …Gator Bowl president Rick Catlett. Appearing on WJXL-AM in Jacksonville last week, he called Notre Dame a “huge coup” for ACC commissioner John Swofford. “Now he’s really enhanced his football bowl opportunities,” Catlett told the station. Catlett explained that the reason why they dropped the old arrangement (ACC vs. Big East) was mainly because the ACC limited his ability to get a desirable team (2 win rule, they couldn’t take a 7-5 team over a less interesting 9-3 team) and the Big East limited the amount of times they could take Notre Dame. UPDATE: ACC just decided not to move to a 9-game schedule. This is in no small part to the addition of Notre Dame.